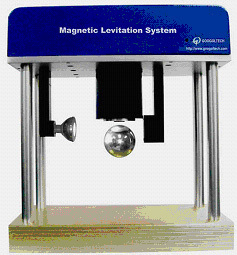 The Magnetic Levitation System (MLS) is composed of an LED light source, an electromagnet, an optoelectronic sensor, amplifier module, an analogue control module, data acquisition card, and a steel ball, etc. Its structure is simple, yet the control effect is very intuitional and interesting. One can easily levitate one or more steel balls in a steady-state position and keep them floating. This system synthesizes main experimental contents in control area and satisfies many experiment requirements such as automatic control, control theory, and feedback system, etc, which are suitable for UG or PG course designs and algorithm research as well. The MLS is a typical non-linear open-loop unstable system. By passing a certain amount of electric current through the electromagnetic winding, it will generate an electromagnetic force. By regulating the electric current in the circuit, the electromagnetic force can be adjusted to be equal to the weight of the steel ball, thus the ball will levitate in equilibrium state. However, this state is an open-loop unstable equilibrium; it is because the electromagnetic force between the electromagnet and the steel ball is inverse proportional to the square of the distance between them. Once the equilibrium state is slightly interfered (For instance, pulsation of the voltage across the electromagnet winding, or vibration around the system, etc), the ball will drop or be gripped by the electromagnetic winding, so the system has to be a closed-loop control system. The measuring equipment, which is composed of an LED light source and a sensor, can detect the variation of the distance between the steel ball and the electromagnetic winding. When the ball is dropping due to interference, the distance will increase. The sensor detects the variation of light intensity and generates a related signal. After the adjusting process by the controller and the magnifying process by the amplifier, the control electric current passing the electromagnetic will increase, the steel ball will be attracted back to the equilibrium position.